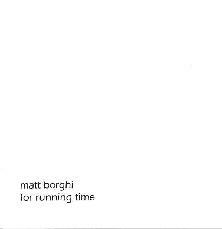 Matt Borghi - "For Running Time"
Based in Michigan, Matt Borghi makes the point that his music is "ambient space, rather than ambient music". According to the promo material, Matt's journey as a musician consisted of a quest for a certain sound-space, the closest manifestation of which for him had been the opening segment of Pink Floyd's "Shine On You Crazy Diamond". The music on "For Running Time" is simple, subtle, and for the most part effective. Matt's strong point is in finding two or more distinct sounds or textures and combining them to produce interesting, and often hypnotic, ambient patterns. And it was the tracks where Matt creates this combination that most impressed me. He hits the mark with this combo on such tracks as "Probably Somewhere", which features slow-paced synth melodies accompanied by singing guitar effects (I think it's guitar?). "Equinox" is a similar track, again including that cool singing guitar. "West Wind" is one of my favorites. Very much an ambient space piece, a pulsating drone provides the backdrop for a slow succession of horn calls, throbs, and heavenly textural lines. It's one of theose pieces where you have to listen closely to detect the variety of sounds and patterns that come together to make the whole. All the tracks are in the 2-4 minute range with the exception of "Autumnal Space", a 27 minute work of pure ambient space. Matt lays down minimalist pulsating synth lines that develop very little, but are hypnotic in a brain-searing way. One line throbs, continually phased in and out throughout the track, while sequenced patterns weave their way through the music. An interesting tune, though I had a tough time sticking out the full 27 minutes. Your can visit Matt Borghi at the b:/group records web site.